Allan was born in Sydney and grew up in Croydon. Working as a bank clerk, he joined the RAAF immediately war broke out in 1939. He trained as a pilot in Sale, Victoria, and then in Canada, before being crewed up in Silloth, England. He flew with an English squadron (267) before becoming the youngest pilot in 459, earning himself the call sign “Babe”. Based in the Middle East, he flew Hudsons against the German forces. 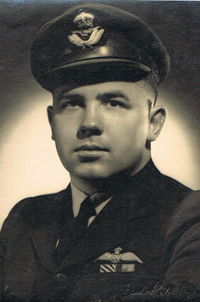 It was in 459 Squadron in 1942 that he obtained a Distinguished Flying Cross (DFC). The citation told how, under intense anti-aircraft fire, he sank several large escorted enemy vessels, displaying ‘outstanding courage and devotion to duty’. In 1944, he joined 87 squadron – a photo-reconnaissance unit flying Mosquitoes out of Coomalie Creek near Darwin. On demobilisation he worked for Qantas, rising rapidly to captain and then second in charge of the route to Papua New Guinea. He also began a relationship with Gertrude (Trudie) Smith, often stopping in Townsville to see her. After being bashed at a Sydney train station, he blacked out during landing; subsequently he grounded himself. He tried in vain to contact Trudie – who by this time was pregnant and refused to see him. In June 1956, he committed suicide off North Head; a fisherman who had seen a body in the harbour confirmed that it was him, although police weren’t able to retrieve it. Trudie was born in Charters Towers in Queensland but grew up in Ayr near Townsville. She trained as a dressmaker, but when war broke out in 1939, she joined the land army (operating out of Mackay) where she drove trucks. She met Allan Proctor at a party he threw after a horse called Proctor won the Sydney Cup. During their ten year relationship, he was based in Sydney (despite frequent lay-overs in Queensland) while she continued to live in Townsville. 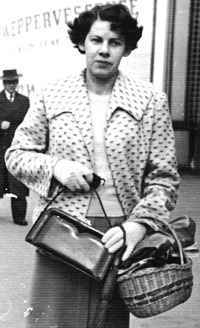 When she became pregnant in 1955, she relocated to Sydney where she gave birth to Nikki in 1956. Immediately surrendering her baby for adoption, she continued living in Sydney supporting herself with clerical work. In 1958, she married Bob Farmer, a former RAAF mechanic. Although she never bore another child, they periodically fostered a young girl. Bob contracted cancer and died in 1967; soon after, Trudie’s home burnt down and she moved back to Ayr. A chronic hoarder, her house became over-run with white ants and had to be demolished; almost destitute, she moved into a small flat with the help of some nuns. She died of a stroke in 2004.